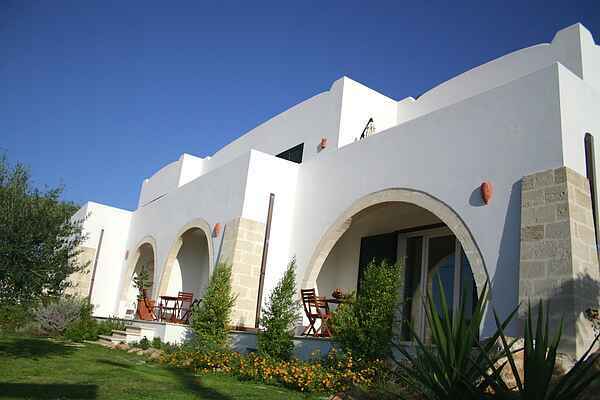 This beautiful complex of six apartments located on a hill and very close to the sea. You have breathtaking views over the coast of the Salento region. Apartment Cinque is tastefully decorated. The residence is located about 800 m from the renowned Torre Fiume XVI century with beautiful views. The charming seaside town of Gallipoli is 4 km away, and the baroque city of Lecce is 25 km. The Salento region is full of large olive trees. The summer is perfect for the beach life and you can swim in the sea until mid-October. The region is known worldwide for its fine wines such as Negroamaro, Primitivo and Salice Salento. Prepare yourself for a nice holiday in the southern tip of Italy with beautiful nature, sea, culture and good food.